LOUVAIN-LA-NEUVE AND LALAYE, BELGIUM AND FRANCE, December 3, 2015 /EINPresswire.com/ -- MEDraysintell releases its new and unique report “Cyclotrons used in Nuclear Medicine, World Market Report & Directory, Edition 2015” that describes more than 1,200 medical cyclotrons worldwide. This first edition of the Cyclotrons Report and Directory is the result of a comprehensive collection of data over the past year that allowed MEDraysintell to identify as many as 1,218 cyclotrons dedicated to the production of medical radionuclides installed worldwide, in addition to 60 cyclotrons which are known to having been decommissioned. This 240-page report provides an extensive review of all cyclotrons installed or recently sold in all countries and regions of the world with an exhaustive profile of the 14 companies currently developing and/or supplying cyclotrons, in addition to a summary of the firms that were active in this market in the past but do no longer offer cyclotrons for sales. The global cyclotron market could be valued at US$ 152 million for the year 2014 and is expected to reach US$ 165 million in 2015. The market achieved its highest level (in US$) ever in 2006 at US$ 176 million, increasing by an average of 4.5% a year from the US$ 87 million level of 1990. However the cyclotron market showed an average decline of almost 2% a year from 2006 to 2014. The market has been very active during the years 2000-2007 with the development of the cyclotron networks for PET in USA and Western Europe and is expected to grow again with the emergence of the Asian and South American markets. Among the active manufacturers, five majors are sharing 90% of the world market installed base (in units), with two of them taking over half of it. Ten companies have withdrawn from this market over the past. 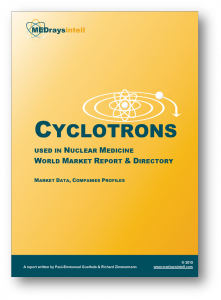 The global cyclotron market is expected to reach US$ 245 million in 2030 showing an annual growth of 3%, with an estimated yearly average sale of 60 cyclotrons over the years 2015 to 2030. As there is a growing installed base it is anticipated that around 2025-2026, revenues generated from maintenance and upgrades will become higher than revenues generated by the sale of equipment.